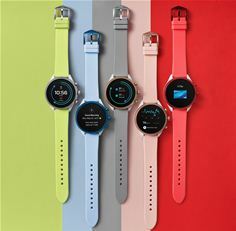 “For several years, the health and wellness industry has been converging with smartwatch technology—and Fossil knew there was a tremendous opportunity to provide a connected option for the design-conscious consumer looking to bring style to their wrist. We know our consumers want versatility both in their activity and their accessories, which is why we wanted to bring a smartwatch to market that is a fit for every style,’’ says Steve Evans, EVP Fossil Group. “We're incredibly excited to be able to offer a colorful sport smartwatch with endless customization and equipped with latest Google and Qualcomm technology for a best-in-class consumer experience." Utilizing the latest Snapdragon Wear 3100 Platform, Fossil Sport helps customers achieve more than a day’s worth of battery life in the full smartwatch experience, and offers a new battery saving mode that adds an additional two days of telling time. So, whether you forget your charger or just choose to unplug on the weekends, battery saver is designed to stretch your watch battery to last until you can charge again. As software experience continues to evolve, battery life will be further optimized. The Snapdragon Wear 3100 platform enhances the ambient mode allowing for an improved user experience--select dials will leverage the new platform to showcase color and a sweeping second hand for more dynamic style.